The Cleveland Cavaliers won the 2016 NBA Championship in one of the greatest Game Sevens the NBA has ever seen. It wouldn’t have been possible without LeBron James, who poured in a triple-double, hit the game-sealing free throw, and came up with, perhaps, the most important defensive play of his career. James led all players with blocked shots in the NBA Finals, none bigger than his chase-down block of Andre Iguodala with 1:50 left in the fourth quarter, the game tied at 89-89. Never mind that it was in an intense moment of the game. James prevented a sure-fire layup, seemingly appearing out of nowhere, then skying to pin the ball against the backboard. LeBron’s superhuman performance to win his first championship with the Cavs, along with being the first team to come back from a 3-1 deficit in the Finals, will go down in history. 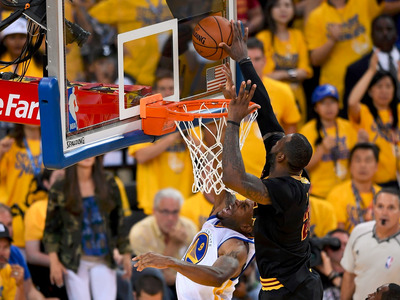 Decades from now, that block will be shown in footage of the greatest plays in Finals history.